Summer-like conditions and a months-long road closure are enough to congest Laguna’s downtown, shown here at lower Cliff Drive. Photo by Marilynn Young. 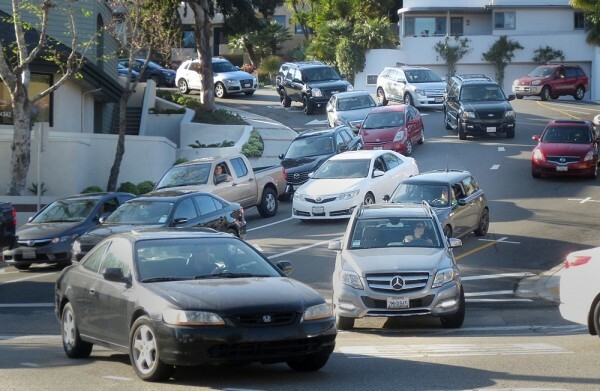 Summerlike weather all-year round is bringing record-numbers of tourists congesting Laguna Beach with cars, the subject of a town hall meeting Tuesday. More than 40,000 vehicles travel through Laguna on any given day, or 100,000 people a day especially if the beach is calling, and their cars clog the town’s small streets laid out more than 100 years ago. “It’s more than our streets were designed to hold,” City Manager John Pietig said. None of that is likely to change; with more residential development in nearby communities, it will probably just get worse, he predicted. Pietig presented what’s been done, what’s being done, what’s planned and what will never be done to assuage traffic to about 50 residents at the town hall meeting in the City Council chambers. The difficulty is not only finding solutions, but getting the community to support them, he said. Home building in nearby Irvine, Aliso Viejo and Lake Forest increases visitors to Laguna Beach, said Larry Nokes, president of the Laguna Beach Chamber of Commerce. “We can’t pretend we’re not having tremendous development,” he said, “and that more people are coming.” Nokes suggested promoting other shopping districts within the city to diffuse the influx of visitors into the downtown. Johanna Felder, president of the low-growth advocacy group Village Laguna, encouraged Pietig to think outside the box for traffic remedies. “Maybe it will get so bad no one will come,” she conjectured. Traffic along Laguna Canyon Road might be creating the “natural congestion” needed to regulate the number of vehicles coming into town, Pietig suggested. In the near future, expect traffic-control guards at key intersections on Coast Highway and more blinking and better-lit crosswalks, Pietig told the group. “Pedestrians inhibit the flow of vehicles,” he said. Traffic guards will stop pedestrians until a group gathers, then get them across faster so traffic is less impeded. They will also “scramble” the crowds, letting them cross in all directions so traffic is stopped for as little time as possible. Another problem discussed was eliminating the bottleneck for northbound traffic where Laguna Canyon meets El Toro Road, site of a 2013 double fatality. Two northbound lanes reduce to one for about 1,000 feet after the signal and before Laguna Canyon Road widens again to two lanes. People actually race each other through the bottleneck, noted Lawrence Zaden, a 15-year resident and ex-New Yorker. Infringing upon protected open space in Laguna Coast Wilderness Park has prevented widening the road there, Pietig said. Bill Hoffman, an urban planner and social ecologist, pointed out that the village entrance, a proposed parking structure near Broadway Street and Forest Avenue that’s been debated for 20 years, was left out of the presentation. Pietig conceded the omission and said it will be added to the presentation. Another element admittedly missing from the presentation was the possibility of enlarging the ACT V parking lot on Laguna Canyon Road. Building it would cost $5 million and it might add 200 spaces, Pietig said. Making the 73 toll road a freeway would eliminate drivers trying to avoid tolls by entering at Laguna Canyon Road, said Sam Goldstein. Building a parking lot farther out on Laguna Canyon Road for residents in outlying communities to park and take public transit into town was another suggestion. Mayor Steve Dicterow is meeting with Orange County Supervisor Lisa Bartlett soon to discuss those possibilities, Pietig said. An idea that doesn’t resonate with residents, Pietig said he supports adding a second outbound lane on Laguna Canyon Road to ease outbound traffic congestion. He pointed out that opponents prefer improvements that make the road safer for pedestrians and bicyclists. Creating more automobile infrastructure will never eliminate traffic, said complete-streets enthusiast Michael Hoag, and will only increase traffic. Focus needs to be placed on encouraging people to walk, ride bikes and take public transit instead, he said. Pietig said the city is studying the local transit line, known as the blue-and-white buses, to see how to increase ridership. Promoting it more with city staff as well as residents to reduce the stigma of riding a bus in a town filled with expensive cars will be considered, he said. Historically Laguna Beach has been excluded from many offerings in from land grants to roads, with the estimated 100,000 visitors on a given day, if it so difficult to admit our town is on par with local amusement park facilities and other major tourist destinations? The only problem is we have residents we are the ones that live here. We gawk and are gawked back at.. We have trash we have traffic and congestion we have the under pinnings of a residential community. We have our own personal vehicles and rights of ownership. In order to take the town back we must include an enforcement of local traffic boundaries or exclude visitor traffic. We have a giant parking lot in the Pacific Ocean right in our back yard. Albeit you can’t park a car there but you can anchor a boat. Of course the need for a permanent structure would be eminent to facilitate safe landing and disembarkment I.E. a pier an jetty or break water. Also a marine based enforcement for policing the added traffic on the water way. The other option or added option that could be implemented in the immediate future could be to only allow local and emergency traffic into the town and neighborhoods and have parking structures on all points of land access North Coast Hwy. South Coast Hwy. and Laguna Canyon Rd. Private transportation from residents, bicycle traffic, foot traffic, and public transportation. Adding separate lanes for each to discourage congestion. Without all this added vehicular traffic the atmosphere would change and the needed for space for business would expand yes the parking revenues might decrease but the added value of the community would increase, but these need for a more affirmative policing an regulatory office would need to be created, but this could be a security amendment to discourage criminal activities, and promote civility among visitors and residents alike. If we’re going to be an amusement park why can’t we be one of the best amusement parks in the country, and start managing or community to deal with these problems head on. If our current government structure is unwilling to look at the big picture may be we should be paying professionals to do this instead? City hall’s solution to relieve auto congestion has always been adding more car infrastructure (read the DSP, Village Entrance Plan, Canyon Road Plan, Culture Plan). How’s that working for us? Cars like silver bullets do not relieve a car-centric mobility system.